Burning permits are required for out door burning of brush piles or wood debris anytime throughout the year. Depending on the current fire danger, restrictions may be in place. Before considering burning, check the predicted fire danger and check with local fire officials or the Maine Forest Service. The Maine Forest Service’s online burn permit system is a safe and convenient alternative to getting a hand written permit. It is the only online burn permit system authorized for use in Maine. It has also been updated to allow more flexible burning times and revenue sharing to participating municipalities. FMI, please visit www.maineburnpermit.com and be sure to follow all the restrictions listed on the permit. Hand written burning permits are still available in all locations without charge. In organized towns, a permit can be obtained from the town forest fire warden, who is often also the fire chief. In unorganized towns, a permit may be obtained from your local Forest Ranger or Forest Protection office. Contact the Forest Protection office nearest you for more information. Campfire permits are required for some remote campsites in unorganized towns. They are site specific, valid for a short period of time and can’t be purchased through the online burn permit system. In organized towns, landowner permission must be obtained and the permit can be issued by the town forest fire warden. Maine maps generally distinguish between campsites that require a permit (permit site) and those that do not require a permit (authorized site). If unsure, it is advisable to ask a forest ranger or fire protection employee in advance. Campfire permits are not required when the ground is covered with snow. Campfire permits are free. REMEMBER : FIRE PERMITS ARE REQUIRED IN MOST CASES. CHECK WITH YOUR LOCAL FIRE OFFICIALS OR ANY MAINE FOREST SERVICE RANGER BEFORE BUILDING ANY OPEN FIRE . 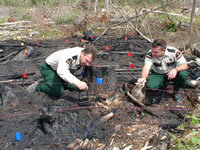 The Maine Forest Service (MFS) participates in the Department of Defense's (DoD)’s Firefighter Property program (FFP). This program is administered through the USDA Forest Service and allows the MFS to acquire federal surplus property and loan or transfer it to Maine fire departments. In most cases, the fire departments can receive title for vehicles and property obtained from this program after it has been in service for two years. This is not to be confused with the older program called FEPP. The MFS no longer screens for that program and fire departments will not be able to receive title on any vehicles or equipment acquired through FEPP. Fire departments no longer actively using FEPP equipment are encouraged to turn that equipment in to the MFS for proper disposal. All requests for federal excess property in the FFP program are routed through the local forest ranger. Requests are evaluated and placed on a priority list. As equipment becomes available, cooperators are notified as names appear on the priority list. Since 2015, the MFS only accepts requests for from fire departments for wildland firefighting equipment acquired in the FFP program. Fire departments interesting in structural, emergency or rescue equipment should contact the Maine Fire Chiefs Association. For more information on this program, contact a local forest ranger or the Federal Excess Property Manager at (207) 287-4989. The purpose of the Volunteer Fire Assistance (VFA) Program, formerly known as the Rural Community Fire Protection (RCFP) Program, is to provide Federal financial, technical, and other assistance to State Foresters and other appropriate officials to organize, train and equip fire departments in rural areas and rural communities to prevent and suppress wildfires. A rural community is defined as having 10,000 or less population. Each year, federal funds are appropriated to assist towns with the purchase of forest fire equipment or to provide forest fire training. Grants require that towns match the grant funds dollar for dollar. August – applications for the upcoming year are made available. November – deadline for applications. December – the Maine Forest Service (MFS) and Maine Fire Chiefs Association review the applications and make recommendations for award amounts. January – Award letters are sent out. March – deadline for the signed agreement and assurances forms to be returned to the MFS. April / May / June – If paperwork is in order, reimbursements are issued to towns. June 30th – deadline for receipts to be turned in to MFS. For more information, contact the VFA Program Administrator at 287-4989. This is protective and investigative services work in detection, prevention, presuppression, and suppression of forest fires and in enforcement of forestry, environmental, and conservation laws. Work includes preparing and updating fires action plans, training firefighters, and supervising firefighting operations; patrolling and inspecting an assigned area; observing, reporting, and prosecuting violations; investigating suspicious fires and suspected criminal activities; conducting public information and education programs; and preparing records and reports. To be a successful forest ranger, an individual must possess considerable knowledge of basic forest fire control, safety, and basic forestry practices. One must also possess the ability to work independently over a large geographic area, establish and maintain effective working relationships in routine and emergency situations, work long hours, communicate effectively orally and in writing, use good judgment, and make sound decisions, all under adverse and stressful conditions. If you have any information regarding arson-related fires, please call 1-800-987-0257 . Your call will be kept in strict confidence. If your information leads to the arrest and/or conviction of an arsonist, you will receive a cash reward up to $2,000.00. Ninety (90%) of all wildfires in Maine are caused by people and are preventable. Only lightning caused fires cannot be prevented. Escaped debris burning continues to be the number one cause, with arson second. Maine's wildfire season usually begins in March in coastal and southern sections, gradually extending to central, western and northern areas. The wildfire season usually ends in late November. The majority of wildfires usually occur in April and May, when home owners are cleaning up from the winter months, and when the majority of vegetation is void of any appreciable moisture making them highly flammable. Once "green-up" takes place in late May to early June, the fire danger usually is reduced somewhat. It is estimated that Maine Forest Service Rangers investigate over 1000 complaints annually involving timber trespass or deliberate theft of timber. Timber harvesting is a large part of Maine's economy. However, often times property lines are not well defined resulting in timber being cut without the landowner's permission. In some cases, a few loggers specifically target forest landowners, especially non-residents and the elderly. Individuals who make their living stealing timber give the entire industry a black eye. The vast majority of loggers are honest, reputable business men and women. Their ability to obtain timber harvesting contracts is hindered by this very small group of timber thieves. Keep all property lines well marked and brushed out. Know who the adjacent property owners are. Have someone keep an eye on your property should you be unable to. Should you suspect someone is cutting wood on your property, call the nearest Forest Ranger. Never give oral permission for someone to harvest your timber. Always have a written contract for all timber harvesting. Keep all copies of scale slips and payment documents associated with each timber sale for at least one year after the timber harvest. Title 17 S2512 states that timber harvesters shall pay the landowner within 45 days of delivering the harvested forest products to the mill. Title 10, section 2364-A, states that the timber harvester shall provide the landowner a copy of the measurement tally sheet or stumpage sheet for each truckload of forest products (which have been transported to the mill) at the time of payment to the landowner. Title 17 S 2510 states that a person can not cut down a tree without the landowners’ permission. If they do, they have committed a civil violation and may have to pay values set by the Legislature as restitution to the landowner plus additional fines to the State. Title 17 S 2511 states that the landowner (or landowner representative) shall clearly mark any established property lines within 200’ of the area to be harvested. The marking must be completed prior to the start of the timber harvest and must be clearly visible. The marking of trees could be more permanent with blazes and paint or temporarily, with flagging or surveyors tape. Title 17 S 2511 also states that a line tree (a tree located near the boundary line that has been blazed or painted) can not be cut without first obtaining permission from the abutting landowner. It is estimated that 2-3 million Christmas wreaths are made each year in Maine, making it one of the largest seasonal industries in our State. It takes an average of 3-5 pounds of brush to make one wreath. Fir and pine tips or brush are among the most in demand. The supply comes from both small and large woodland ownerships. The harvesting of wreath brush or tips is commonly referred to as "Tipping". Maine Forest Service rangers spend a great deal of time enforcing these and other related laws. The "Tipping" season usually begins in early November and ends around the second week of December. Cutting. If engaged in cutting, a current written permit or bill of sale from the owner when cutting growth of another. Transportation. If engaged in transportation, a current written permit, bill of sale, port of entry statement or other written proof of ownership when transporting for commercial purposes trees, loose or in bundles, or boughs, loose or baled. A driver shall carry this permit on his person or in the vehicle. The Maine Forest Service is a member of the Northeastern Forest Fire Protection Commission or "Compact" which was formed shortly after the devastating forest fires of 1947. Members include all the New England States, New York, the Provinces of New Brunswick, Quebec, Nova Scotia, Newfoundland, and Labrador, plus the New England Forest which includes the White, Green and Finger Lakes Forests. This Compact was assembled to bolster fire suppression capabilities, as well as meeting training needs. Equipment and manpower are often called upon during the forest fire season, greatly increasing each member's fire fighting arsenal. The full membership meets each year during a week long winter training/meeting session. Former State of Maine-Forest Commissioner Austin H. Wilkins was instrumental in forming the Compact, in 1949.